Black vinyl trousers, cut in a general “jeans” pattern. No above-the-knee seams. There appears to only be one pocket on the trousers and it’s a horizontal pocket on the right-hand side. The style of the pocket is known as a bound pocket. The best deal on custom leather trousers is from South Beach Leather. 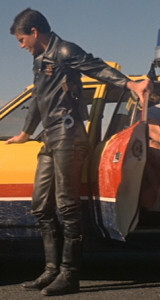 The belt on the trousers is a black leather belt with a rectangular centerbar buckle, possibly a garrison belt or similar. The belt is tapered at the end, and some have grooves along the edges. 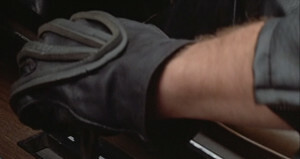 Black motorcycle boots, also known as engineer boots. The boots were made by Rossiter’s, an Australian boot company. 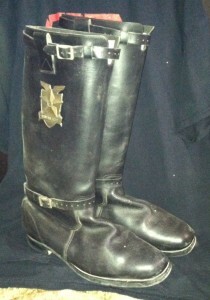 The right boot bears a badge on the outer side. For more info, go to Special Topics: Boots and Tutorials: How to make Max’s boots. 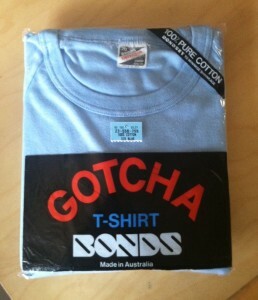 Light-blue Bonds “raglan-cut” cotton T-shirts, which are still popular in Australia today, although the light-blue color appears to have been discontinued sometime in the 1990s. Bond’s name for the light-blue color was ice blue. Raglan-cut cotton T-shirts in solid colors are extremely rare otherwise, and one similarly-colored alternative for your replica uniform is the American Apparel baby blue T-shirt. Black oval convex plastic plating. Unidentified origin, but they appear to have been originally white and appear to have stitch holes along the edges of the caps. The caps were painted black and riveted onto the jackets. Most caps are held on by 10 – 12 rivets each. 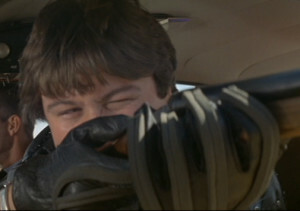 The MFP wore black motocross/motorcycle gloves. These vintage gloves had foam rubber strips sewn onto the tops. 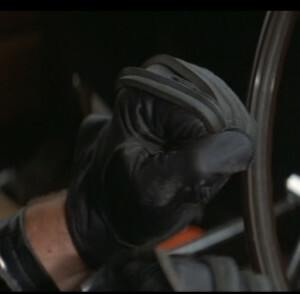 The gloves in the film appear to be made of deerskin. 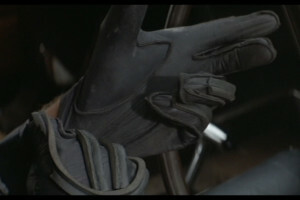 From what I have heard, the MFP gloves were readily available in Australia in the 70’s. Abbyshot clothiers has apparently discontinued offering their replica gloves. Slightly less accurate but cheaper pairs (and apparently thinner and more form-fitting) have been found on eBay. Silver pin-on name tags. 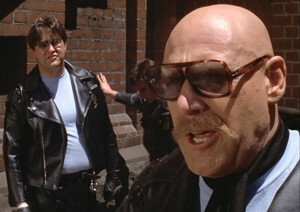 Name tags display the officer’s badge number, as in Max’s “MFP 4073.” These are apparently still available in a badge set through Abbyshot. 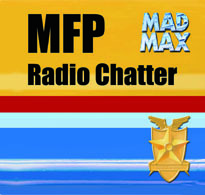 The MFP wear several pins on their left sleeves. Fifi, Max and Goose wear the crosshairs pin. Roop and Charlie wear the rectangular clover pin. 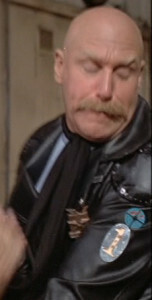 Fifi wears an oval “1” pin below his target pin. 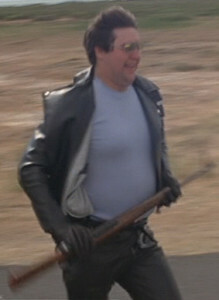 The MFP carry black wooden nightsticks. Nightsticks can be seen hanging from the adjustment tabs on the jackets. 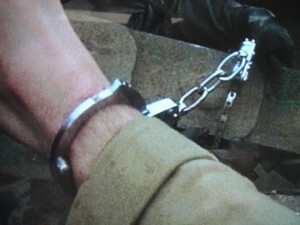 The MFP’s handcuffs have 3 links in their chain, as opposed to 2. They could have been cheap toy novelty handcuffs, or just a less common model. Handcuffs appear to be worn looped around the belt, instead of worn in a case. Airsoft versions are often available for your costume. Here is a 4-inch Smith & Wesson style revolver. 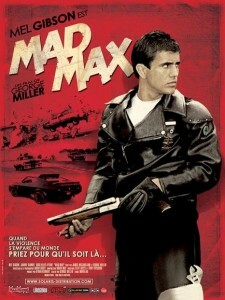 To find out more about the most accurate Max replica uniform ever made, please see this post by MadMaxCostumes.com contributor Max Replica. 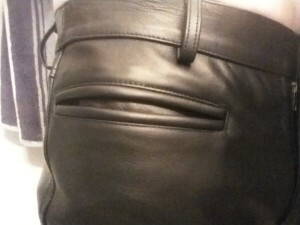 A view of the trouser pocket. Here one can clearly see the distinctive seams of the Bonds raglan-cut t-shirt. 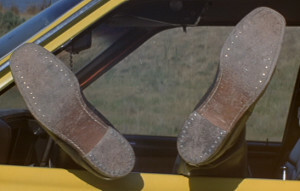 A fan’s screen-accurate Rossiter boots, with badge. 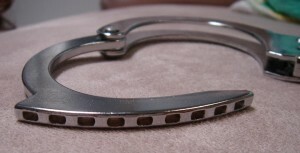 The far cuff has round holes along its edge. A fan’s replica MFP trouser with accurate bound pocket. 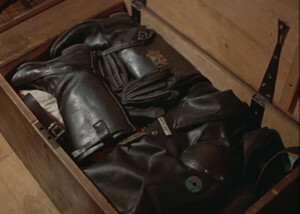 Max’s uniform in his chest: boots, belt, gloves and jacket. Messy spray painting of the rivets. Johnny the Boy with Max’s 3-ring cuffs. 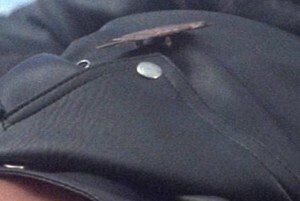 Fifi’s “1” pin clearly seen. 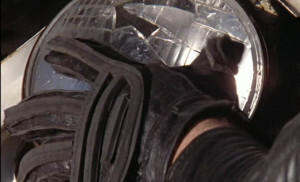 Notice Max’s gloves, belt and the top of his shotgun holster. 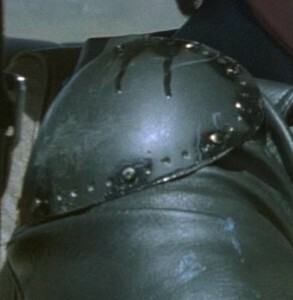 Note the rectangular holes on these novelty cuffs. The cobbled soles of Charlie’s Rossiter’s engineer boots. 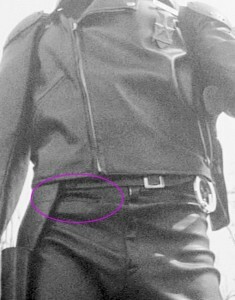 Notice Max’s handcuffs are attached to his belt or belt loop. 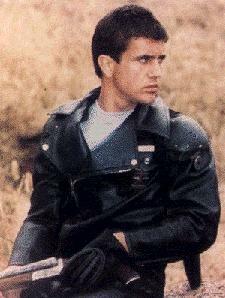 Here it’s obvious that the MFP jackets are made of vinyl. There is no liner sewn into the jacket. The underside of the vinyl material can be seen. Note: cuffs looped into belt, tapered belt, grooves on belt. 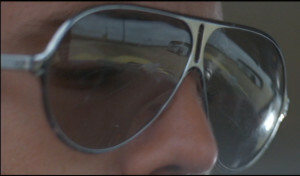 A close look at the sunglasses that only Max and Goose wear. 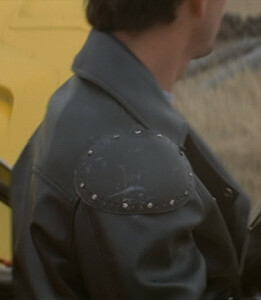 Max’s right shoulder cap. 12 rivets. Original ice blue Bonds t-shirt. 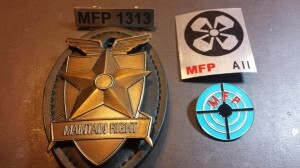 Replica badge and pin set. 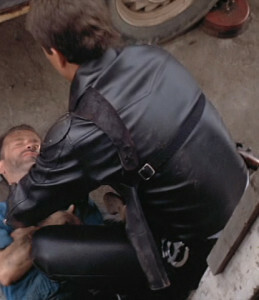 Max’s baton / nightstick is tied onto his jacket’s right adjustment tab. A Hindu rayon shirt from India covers Max’s uniform. 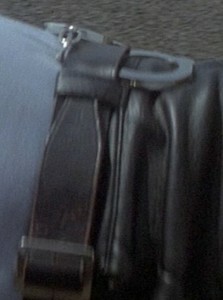 Another look at the holster. Here you can see the horiontal pin holding the badge on. 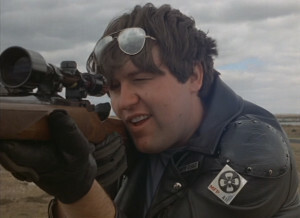 Roop, MFP 3582, is seen here with the “MFP A11” clover pin, MFP gloves, jacket and silver reflective aviator sunglasses. 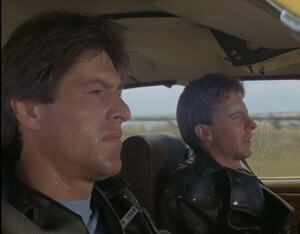 The sunglasses are different from the ones worn by Max and Goose. A photo of a very accurate baton grip.